Giant-Size Geek is now on Blogger! This is next step in the evolution of this blog, which started out on a Movable Type hosted solution as Photon Torpedoes in Spring 2005. In 2010, I changed the title to Giant-Size Geek, and started featuring larger artwork, book reviews, movie posters, etc. But the MT site I was working on had lots of problems. Now that I've moved it over to Blogger (which I find to be a very rich platform with lots of cool tools) site management is less a of a hassle, plus it's free! To celebrate, here are a couple of classic Legion of Super-Heroes covers by Mike Grell. I am sure all die-hard Legion fans know and love this 1978 Treasury cover by Mike Grell. This special edition contained a whopper of an original story, featuring Saturn Girl's marriage to Lightning Lad, plus a time-bending adventure that followed, courtesy of Paul Levitz and Mike Grell. This scan, which reprints Grell's cover with great color and clarity, comes from the book Legion of Super-Heroes: 1050 Years of the Future . 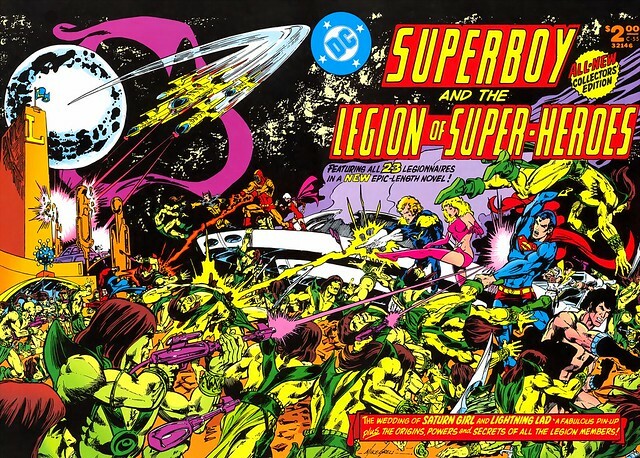 I've always thought that this cover was one of the best for the Legion or any group of super-heroes. It made great use of the wraparound spread to showcase the team fighting an army determined to get them. Saturn Girl's rockette-style kick isn't bad either. If you are interested in a recap of the story, check out Retro Reviews. 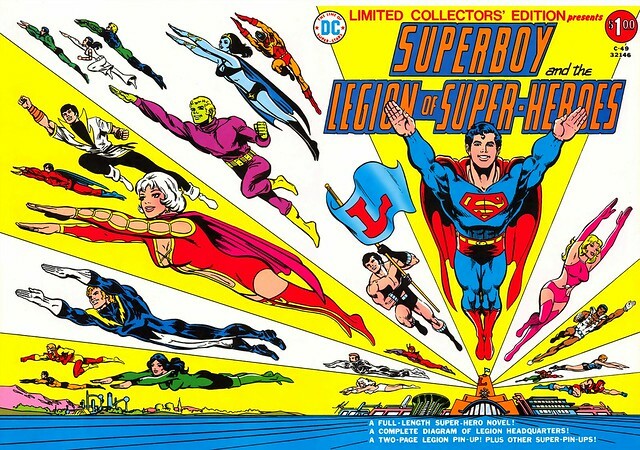 Grell also provided this wraparound Treasury cover in 1976 for Superboy and the Legion. This special featured a number of reprints, pinups, and diagrams. Grell makes a classic use of perspective to showcase the heroes in their nifty Cockrum costumes, flying away from Legion HQ. And again, there's Saturn Girl in that great outfit. Nuff Said!